Sea girls are a British Indie band consisting of Henry, Rory, Andrew and Oli. 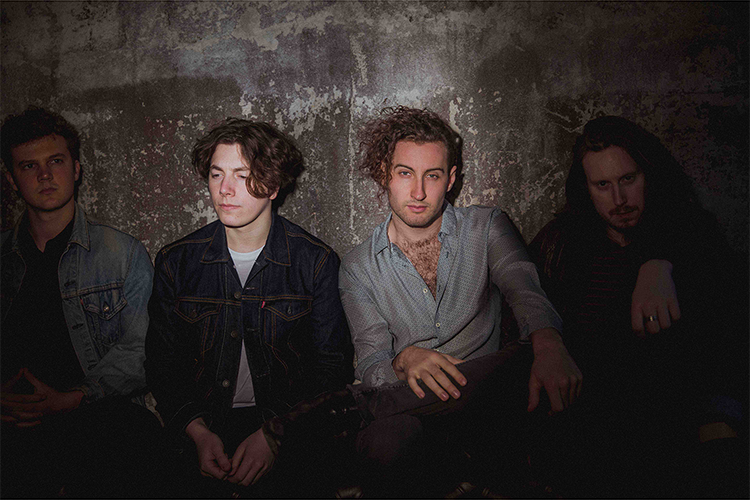 The band released their debut single, Daisy Daisy, in 2016, which was followed by their debut EP, ‘Call Me Out’, in 2017. Last month the band released their ‘Adored EP’, out on an ltd edition 7” vinyl. Featuring singles “Too Much Fun” the perfect summer anthem, a powerful reminder that of how keeping things simple can prove incredibly effective. The Ep also includes “Eat Me Whole”, as well as newly recorded title track and growing live favourite `Adored'. This is a band you need to see live, adept at delivering simple storytelling and arena-ready anthems. Playing their tightly honed tunes, with crowds chanting back every word on songs that pack such solid punches. In between their packed live schedule over the summer, the band are heading back to the studio to record new material which will debut at shows later this year. With the release of the new video for “Too Much Fun” a summer of festivals and an Autumn headline tour coming up we wanted to find out more, so we asked guitarist Henry Camamile singer/songwriter our 10 questions. A lot is through word of mouth or each other “showing and telling”. More recently it’s artists we are coming across and are on bills with at festivals. The Spotify and Apple playlists always throw great gems our way I’ll hear something through that and tell the other guys and they will say “yea I’ve been listening to them for the last year”. We have a video for Too Much Fun dropping as we speak that’s a “groundhog night out story” and of course Reading and Leeds festivals yet to play which is going to be epic! Can’t believe the reaction we’ve had at festivals, we’ve felt really blessed for that. First song I, (Henry) fell in love with was “Still You Turn Me On” by ELP. I was brought up in prog rock as my mum used to be a prog DJ. I think “Run” by Snow Patrol would have been one of my favourite tracks when I was young that really connected with me. I’ve always said Lana del Rey would be a dream collaboration - love her cinematic vibe and hopeless original lyrics. Listening to a lot of Arcade Fire, Bruce Springsteen. Loving Yonaka who we come across on the festival circuit. Florence and the Machine has got a powerful new album so loving that too. Human imperfections, weaknesses, emotions. I guess we try to distill feelings. It’s quite liberating putting out something you wouldn’t openly just say like your insecurities. Sometimes it’s to change a mood. “Adored” is great live and always a special part of our set. Our favourites change all the time though. “Eat Me Whole” felt pretty special at All Points East and starting our set with Lost feels pretty powerful. We’ve wanted to play a few places with cool histories. We actually get to play Razzmatazz in Barcelona this weekend, it feels like a right of passage and a super cool place to do our first show outside the UK. Loads of awesome bands have done the same night: Arctic Monkeys played it, Blur too. It will be the most rock n’ roll gig we’ve done to date.